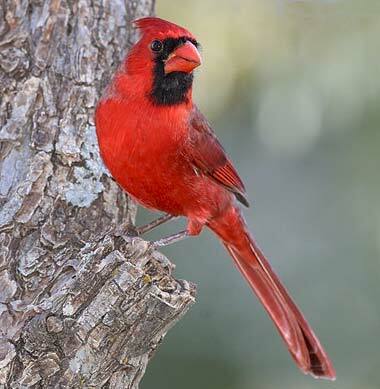 The cardinal (Richmondena cardinalis cardinalis) was adopted as the state bird of Indiana by an act of the Indiana General Assembly of the State of Indiana on March 2, 1933 as proposed by Senate Bill No. 160. The male is bright red; the female is brown with dull red crest, wings and tail. They remain in Indiana year round and nest in thickets of brambles or low saplings. The eggs, 2 to 4, are bluish-white with brown markings. "Section 1. Be it enacted by the General Assembly of the State of Indiana, That the bird commonly known as the red bird or cardinal (Richmondena cardinalis cardinalis) is hereby adopted and designated as the official state bird of the State of Indiana." The following information is excerpted from the Indiana Code, Title 1, Article 2, Chapter 8, Section 1-2-8-1. Sec. 1. The bird commonly known as the Red Bird or Cardinal (Richmondena Cardinalis Cardinalis) is hereby adopted and designated as the official state bird of the state of Indiana. This website is an unofficial source of news and information. This website is the composition of many hours of research. Information contained within this site has come from numerous sources such as websites, newspapers, books, and magazines.